I’m always fascinated by where writers write and what their writing spaces look like. 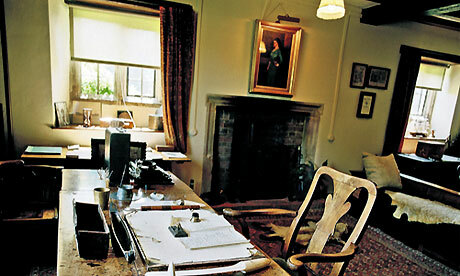 I enjoy looking at pictures of famous authors’ desk and writing spaces. Some places where writers write are pretty awesome. 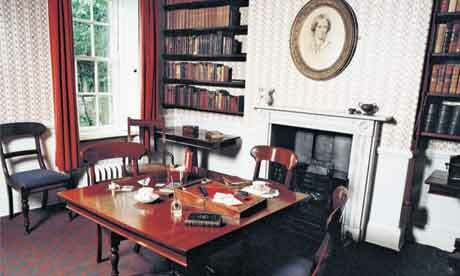 This blog has some wonderful examples of famous writer’s offices. If you’re as fascinated by where writers write as I am, I recommend these sites. After thirty-three years of working in my old office, our recent move meant I had to create a new writing space. The old room offered plenty of space for me, my writing assistant plus two desks-one for my laptop and one for my desktop, a Xerox machine, and multiple bookcases. A complete world for my writing space. Not so in our new location. This house has 1,200 square feet compared to 3,600 square feet in our old home. Needless to say, my new writing space is MUCH smaller. I can work in small spaces. I’ve written in cars, hotel rooms, on a train, and even on a cruise. All I need is spot for my computer or AlphaSmart. But there’s something special about having my own office space. Now I’m using the smaller extra bedroom. Too bad the desk I brought with me was designed for a much larger space and the room already has a twin-sized trundle bed. 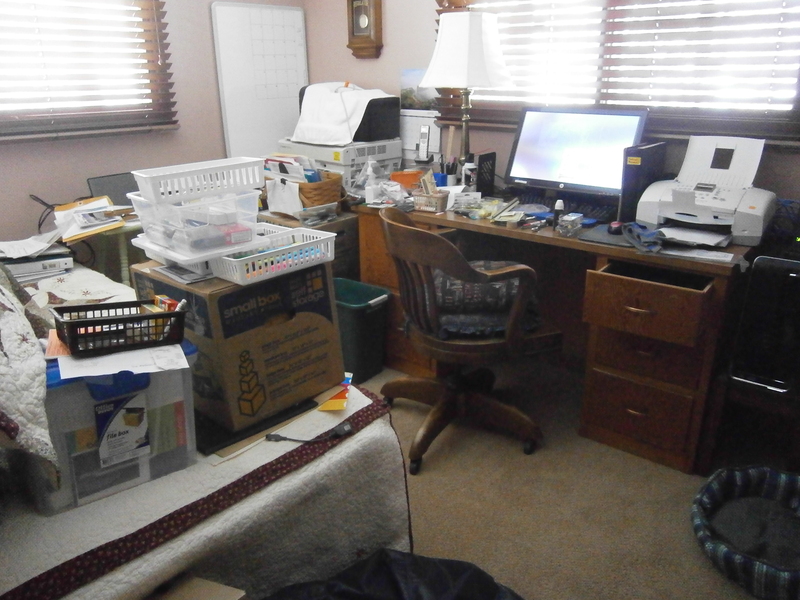 The real problem was finding places for all the extra-writing stuff—printers, files, reference and resource books, etc. No room for the tables, file cabinets, and bookcases. After weeks of placing things, my office writing space now looks like this. Plenty of room for my writing assistants and me. With my office set up again, I’m set to get back to some serious writing. 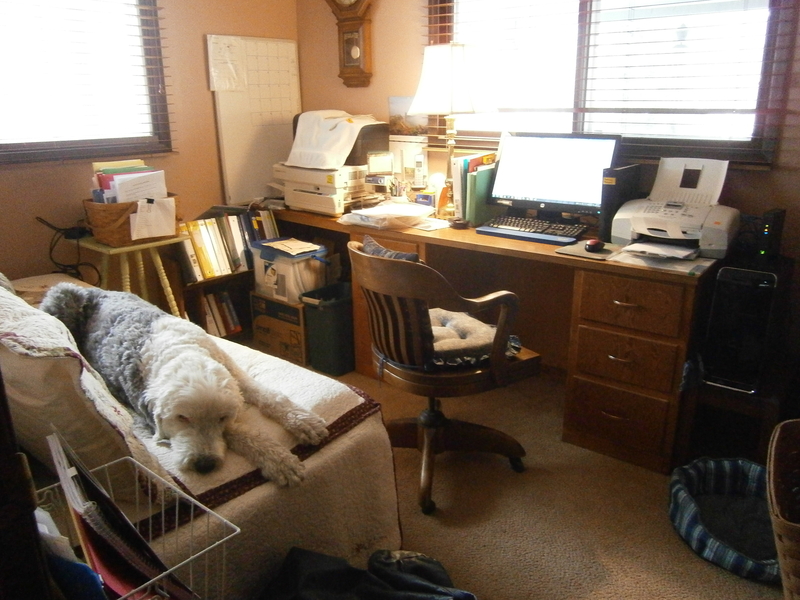 YOUR TURN: Do you have a writing office? If not, what is your writing space like? Janie, Thanks so much for stopping by. How lucky you are to have your world for writing. I really hate sharing with the guest bedroom. Maybe some day I’ll once again have my own office. Like you I have an office. The family built it for me and it contains MY world. Desk from Ashley’s that called out to me. Drop leaf table that at the time was very hard to find. Shelves for my books and another for the odds and ends. Wish I could insert photos–I’d share my lovely writing space. Oh and my two writing assistants *Grin* also of the K-9 persuasion.